Please make welcome author Sherri Johnson! Hi, Sherri! Give us a couple sentences describing what you write. I write both Historical and Contemporary Inspirational Romance with a sprinkling of Suspense. romantic, heart-warming, heart-wrenching, suspenseful, sweet. For Rex, I would cast a young Tom Selleck or young Sam Elliott. Maybe Hugh Jackman with a beard. For Cora, I would cast Cobie Smulders from Agents of S.H.I.E.L.D. Song of the Meadowlark is about starting over and second chances. I wanted to explore the idea of a woman on a quest for forgiveness (both giving and receiving) and getting lost along the way, then finding herself and so much more in the end. I'm currently working on a romantic suspense with an Assistant D.A. as the heroine and a defense attorney as the hero. All she wants is a vacation. What she gets is a "conflict of interest" when the charming defense attorney charges into her life. Ooooh!!! Sounds interesting. :) Describe your writing space. I work in my daughter's former bedroom. She moved out two years ago and I took over.  I sit on a comfy couch with my precious Chihuahua, Posey, by my side. My flowering cactuses sit in the windowsill and brighten the room. I am in the process of hanging framed photographs of the ocean, my true inspiration, on the walls. A cup of coffee, my Bible, and some sunshine is all I need to get me started for the day. Do you work a "day job?" I work from home as a freelance editor, virtual assistant, and bookkeeper for several different companies. Is there a secret/technique you’ve found that helps with balancing the writing and working life? I write best at night because I'm a night owl and that's when my juices start flowing. But that's also when my family is home. So I make sure to get all of my "real jobs" done before everyone comes home for the evening. If I get done early enough, I usually edit. I write in bed at night using my cell phone. I email whatever I've written to my computer and insert it into my manuscript the next morning. Writing is like playing to me most of the time. So I work hard to get the work done so I can play. Prioritizing is the key. Not wasting time on things that rob you of your creativity. On a dream research trip, where would you go? What would you ask to see/experience first? When you read, do you prefer paperback, e-book, or audio? I don't have an eReader and since I'm on the computer all day for work and doing my writing, when I read, I like to curl up with a book, smell the ink, turn the pages. I'm old-fashioned. I hate to see real libraries disappear. Sherri Wilson Johnson lives in Georgia with her husband and two children. She loves to dream of romantic places and romance in general–good, clean romance. She is a bird-watcher, loves the ocean, roller coasters, ice cream, her family and her Chihuahua, who faithfully sits by her side every day when she writes. She is represented by Les Stobbe, is a graduate of the Christian Writers Guild writing course, a blogger, virtual assistant, freelance editor and a former homeschooling mom. Sherri is the author of To Dance Once More (OakTara) and Song of the Meadowlark (OakTara) and is a columnist for Habits for a Happy Home and Choose NOW Ministries. 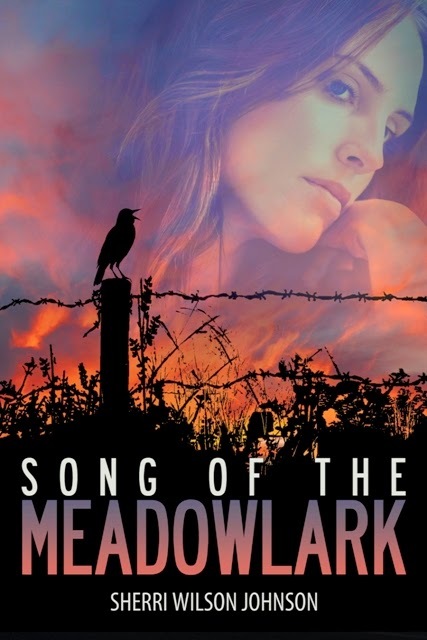 Here is Song of the Meadowlark’s synopsis: When trusting others only leads to pain and rejection, and loving ends only in loss, what will it take to restore hope again? Shunned by the uncovered truth about her missing husband’s secret life, Cora Buchanan sets out on a road trip for home to mend her broken relationship with her parents. When her car breaks down, she’s stranded in a small Georgia town. While staying at the struggling Southern Hope Ranch, she meets little Susie O’Reilly, who unexpectedly fills a void in Cora’s heart. But Rex, Susie’s rugged cowboy father who lost his wife a year earlier, seems to go out of his way to either confront or avoid Cora. It doesn’t help her comfort level that the news continues to report missing and murdered women in the area. Cora has no idea just how close to home the crimes will hit…or how much the sweet sound of the meadowlark’s song at the ranch will impact her future. But definitely "Like" my author's Facebook page, follow me on Twitter, Pinterest, Google+ (as Sherri Wilson Johnson), and Goodreads! Thank you for this opportunity to share about my writing!